Pentecostals owe a debt to Martin Luther. ctober 31, 2017 marks the 500th anniversary of Martin Luther’s posting of his “Ninety-five Theses” on the door of the Castle Church in Wittenberg, Germany─the event that initiated the Protestant Reformation. Luther’s document attacked “the Catholic Church’s corrupt practice of selling ‘indulgences’ to absolve sin. His ‘Ninety-five Theses’ . . . propounded two central beliefs—that the Bible is the central religious authority and that humans may reach salvation only by their faith and not by their deeds” (www.history.com). The Protestant Reformation was not a one-layered movement. Amid the context of late medieval ferment, four movements emerged in 16th-century Europe that changed the Christian world. There were the Lutheran and the Calvinistic branches, the Anglican movement in England, and the so-called radical or left-wing groups (such as the Anabaptists) on the continent and in England. Martin Luther did not overshadow all that was taking place across Europe, but he symbolically stands as the most prominent figure in the reformation of the church and the spirit and doctrine it represented. Rome’s appeal to its own traditions had taken on an authority equal to that of Scripture and moved the church farther away from the Gospel. Before any other issue could be meaningfully addressed, the church would have to decide whether it would listen to the voice of tradition or Scripture. Would the church continue to conform to its own traditions or would it listen to the voice of God speaking through His Word? 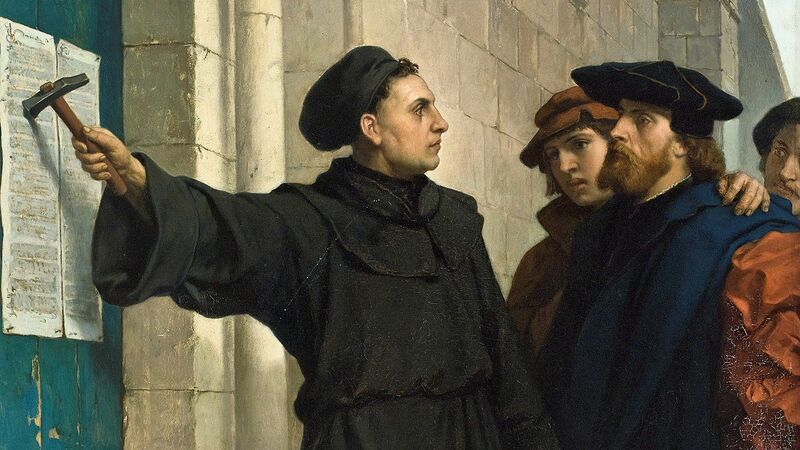 Against this background, the Protestant Reformers insisted on the principle of sola Scriptura (Scripture alone) as the only true basis for doctrine, liturgy, and morals. From the authority and primacy of Scripture, Luther addressed the three major theological issues the Reformers had with Roman Catholics: justification, the Church, and the Sacraments. Pentecostals have always stood in solidarity with this Protestant principle as the fundamental tenet of their faith. Early members of the Pentecostal Movement were distinguished more by their passion for a deeper spiritual walk with God than by a specific doctrine or practice, but they too adopted a formal principle for their movement. Historian Charles W. Conn notes in Like A Mighty Army that at the momentous beginning of the Church of God (known then as the Christian Union), those who joined the movement committed to “take the New Testament, or law of Christ, as their only rule of faith and practice.” All else that they believed and practiced would rest upon the Word of God. When young Luther began his serious study of the Scriptures, he discovered the Gospel of grace centered in Jesus Christ and the Cross. Justification by faith was, for the Wittenberg reformer, the summary of all Christian doctrine. Virtually all that Luther believed and taught was grounded in the Cross and the sovereignty of God’s grace. The world cannot know God or be rightly related to Him in the glory of its self-confident reason and moralism. God can only be known and honored, Luther emphasized in the Heidelberg Disputation of 1518, through the weakness and foolishness of the Cross. The theology of the Cross recognizes Him in the hiddenness of His sufferings. Those who are called to follow Jesus have been called to suffer with Him and know Him in the righteousness of Jesus Christ. The cross of Jesus is the only valid standard for a true knowledge of God and ourselves. It stands in history, but its point of origin and its absolute standard of truth lies outside the relativities of time and place. Justifying faith, grounded as it is in the love and grace of a cruel Cross, was the theological touchstone of the Protestant Reformation. The Reformers made the Gospel central to everything else. The essence of the Gospel is its announcement that through the death and resurrection of Jesus Christ we are justified by grace through faith, not by our works or how well we keep the Law. The Law never justifies; it condemns. Its purpose is to bring us to Christ. The liberty that people had long sought for was finally realized through the proclamation of the grace found in Jesus Christ. Their newfound freedom in Christ was not a license to sin, or to disregard the commandments of God, but to serve both God and neighbor through the inner obedience of a transformed heart. From this fundamental insight of justification by grace, illumined to Luther in his study of Romans, reforms flowed from the Reformers that would alter their view of the church, the Sacraments, Christian worship, and church order. They removed the hierarchy from the church and replaced the office of the priest as mediator with the concept of the priesthood of all believers. What the Reformers wanted most was to reestablish the sovereignty of Christ over His church, recognize the centrality of the Scriptures, and observe the sacraments instituted by Christ (baptism and the Lord’s Supper). Protestant congregations called gifted pastors and teachers to fill the offices of the church. Pastors were properly trained for their task, but ordination ceased to have sacramental meaning. The minister was regarded as a servant of the Word he proclaimed. His primary responsibilities were to preach the Word and administer the sacraments. He was no longer expected to be celibate but could marry. The pulpit became the central focus in Protestant churches as the sermon became the central act of the worship service. Laypeople were given more participation in the worship service through the singing of hymns, the reading of the Word, and full participation in the sacraments. These were critical changes that literally reshaped Protestant churches. The richness of the Reformation legacy, however, was not limited to its theology or its liturgy. The Reformers gave us a Biblically based ethic and manner of life, grounded in a grace-dependent relationship to God. Christians were reminded that the Law points past itself to a grace-filled life of love and liberty that is centered in service to God and neighbor. A grace-dependent life does not depend on feelings or circumstances, but on what God has promised in His Word. We have been released from our compulsion to do everything for ourselves. The ownership of our life has been transferred to Him and His sovereign grace. We are not meant to live a life of anxiety and worry, nor are we expected to depend on our merits and accomplishments. We have that in Jesus Christ. We live under the reality and demands of His cross, but His presence and power lightens our suffering and “cross-bearing” experiences. Our hope, both present and future, is not grounded in human goodness or human potential, but living in God’s sovereign promise of resurrection and the renewal of all things. Pentecostals are deeply indebted to other spiritual movements that followed the Protestant Reformation; namely, Arminianism, revivalism, the holiness movements of the 18th and 19th centuries, and the outpouring of the Holy Spirit at the turn of the 20th century. From these movements, Pentecostals embraced a more Arminian perspective in their theology─the conviction that saving faith must pass from Biblical testimony into personal experience, believer’s baptism, a holy life, an openness to the operation of spiritual gifts in corporate worship, and the baptism in the Holy Spirit. These emphases find their fundamental significance in the fact that they flow from the great affirmations of the Reformers, especially the authority of Scripture and the Gospel of grace that is centered in Jesus Christ and His redemptive work. This is the heart of the rich heritage we have received from the Reformers that we, as Pentecostals, appreciate and celebrate with other believers during this time of recognizing our Reformation legacy. John A. Sims, Ph.D., now retired, served as professor of theology at Lee University and as president of European Theological Seminary in Kniebis, Germany.